Home > Forum > Star Citizen > Merry Motherfuckin' Christmas! I'm still not sure why I did it...not even sure HOW I did it (they sold out in less than a minute)...but we have a MOTHERFUCKING CAPITAL SHIP! 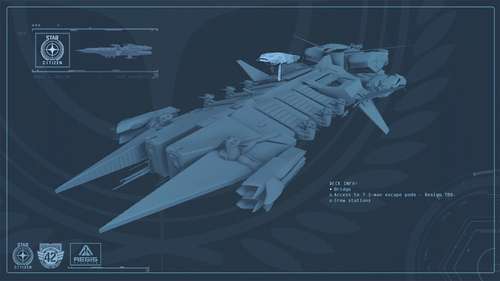 We need a crew of 23 to run it, and even more to fly any ships out of the hangar or as escorts. You guys better recruit like you've never recruited before. The Javelin’s heavily armored bridge looks out over the rest of the ship’s superstructure. Centered around a fleet-class command-and-control interface, the bridge allows a dozen crewman to have full run of both the destroyer’s facilities and eye-on awareness of its deep space environs. Bridge positions include captain, executive officer, communications, weapons, radar, helm and science positions. The bridge is surrounded by escape pods designed to allow the entire command team to make a quick egress should the worst happen. These escape pods, which can be found throughout the ship, are designed to carry five crew each. These escape pods are military-spec, oriented for easy retrieval by unladen Argo transport ships. The Javelin’s Top Deck, also known as ‘officer country,’ is home to quarters for the ship’s captain and executive officer, with all the comforts of home. The prime attraction of the Top Deck is six modular rooms and the upper hangar (used for smaller launches or cargo.) Aegis Dynamics produces an array of battle-oriented room modules which can easily be slotted in and out of place while the Javelin is on orbit; a number of other manufacturers are now creating aftermarket modules for civilian roles such like science and cartography. Additional escape pods for officers are present on the top deck. 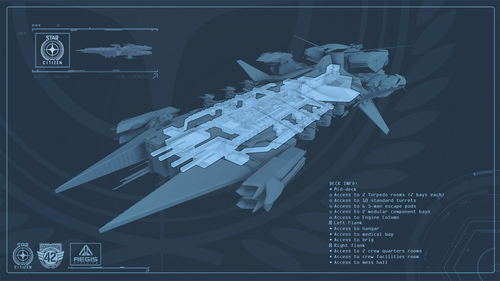 Javelin isn’t just a name; the ship’s internal layout philosophy is based around long, straight ‘javelin’ corridors. Right angle turns are used almost exclusively to connect to more long, straight corridors, giving the ship an overall cramped but stretched feel. Mid-Deck aboard a Javelin is where the real work happens. It includes access to two torpedo bays and six turret emplacements, giving the ship both offensive and defensive capabilities. The Javelin’s engine column is located here, and the Navy advises that it be staffed at all times for optimal performance. Onboard communications connects the engine column directly to the command stations on the bridge. Two of the modular component rooms can be slotted on to the mid-deck. The ship’s left flank includes access to the hangar, medical bay and brig, while the right flank includes two sets of crew quarters, showers, toilets and the mess hall. Mid-deck also includes escape pods. Each deck is given a specific function and in the case of the mid-deck, divided laterally with crew habitation and functions placed on the right and military functions on the left. The sub-decks are reserved for engineering and turret access with their cramped, dimly lit corridors reflecting their utilitarian maintenance purpose. The Javelin’s bottom deck includes six dedicated cargo rooms, two engineering facilities and access to the engine column. From the engine column, crew can access two STS turrets and four of the modular component rooms. The Javelin’s main hangar is also located in this area. While smaller than a dedicated carrier’s hangar, the Javelin can still accommodate a limited number of individual spacecraft. 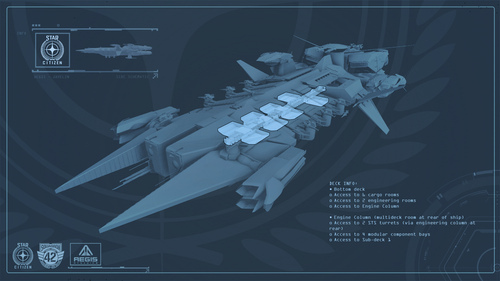 The Hangar is primarily designed to deploy a single Aegis Redeemer gunship and a crew of marines for boarding operations, but other ship types can also be stored. A chart of existing types is attached. Finally, the Javelin has a pair of sub-decks with access to additional functionality. Sub-Deck 1 provides access to two modular component rooms, while Sub-Deck 2 features three Class 6 ATA turret emplacements and a maintenance EVA airlock. The Sub-Decks are the area most exposed to space, and are the best place to assign junior organization members. 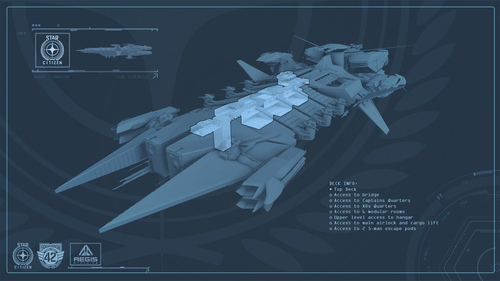 The ship’s six-total swappable ‘customizable rooms’ make the base Javelin a chassis that can be customized for different roles by switching these rooms. Although first and foremost a combat focused ship, this flexibility has allowed the Javelin to serve well beyond the life expectancy of other ships of its age.